Mix the water, oats and Splenda, then microwave for one minute. 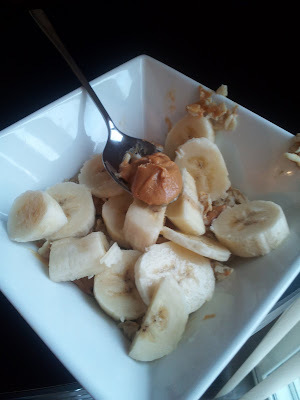 Stir in the peanut butter, top with bananas and enjoy all the delicious goodness of a morning bowl of oats. yum! and I'm obsessed with PB. or almond butter. or sunflower butter. apparently I just like butters :) yum!! Since I am Italian I don't eat breakfast (only coffee and maybe a biscuit), but my husband the New Zealander could eat this for sure :-). And he runs too!